North Carolina Theatre and 31 Days of Art are privileged to bring you A Chorus Line, winner of nine Tony Awards, including Best Musical. This beloved production is a stunning musical-vérité about a chorus audition for a Broadway show. It’s a brilliantly complex fusion of dance, song and compellingly authentic drama–telling the achingly poignant ambitions of professional Broadway gypsies to land a job in the show. As such, it’s a powerful metaphor for all human aspiration and a celebration of the American musical, itself. This classic tale centers on 17 Broadway dancers and travels through the audition process as they describe the events that shaped their lives and they come face-to-face with the reality of a career in show business. Memorable musical numbers include "What I Did for Love," "One (Singular Sensation)," and "I Hope I Get It." North Carolina Theatre brings a diverse cast with versatile backgrounds to the stage. Jessica Lee Goldyn, Nathaniel Shaw, Tito Hernandez and Ashley Adamek headline. 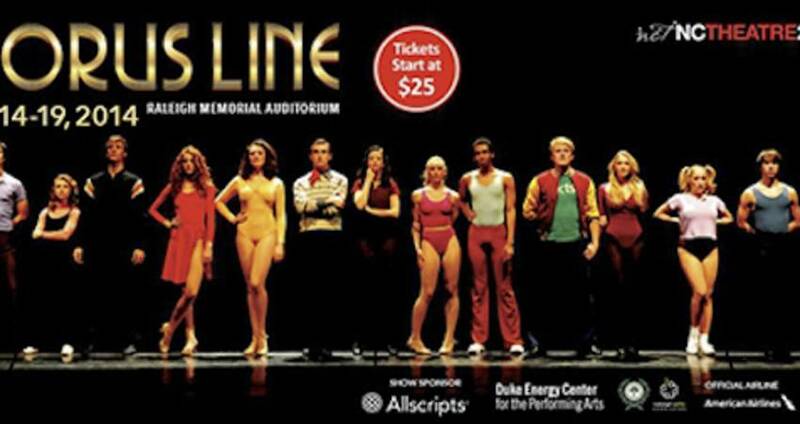 A Chorus Line is part of the North Carolina Theatre’s 2014-15 season. Catch the sensation at the Duke Energy Center for the Performing Arts, Oct. 14-19. It’s all for you during Greater Raleigh&apos;s #31DaysOfArt. For more information, click here.